By Chris Williams: Oscar De La Hoya says he expected a lot more from Adrien ‘The Problem’ Broner in his loss to Manny Pacquiao last Saturday night in Las Vegas, Nevada. De La Hoya felt that Broner (33-4-1, 24 KOs) can do a lot when he’s taking his fights seriously. De La Hoya relates Pacquiao’s victory to him being a hard worker, and Broner, 29, was unable to match that in losing a 12 round unanimous decision at the MGM Grand in Las Vegas, Nevada. “I thought Broner was going to do a lot more. I always have a lot of confidence in Broner’s ability when he takes the sport seriously,” De La Hoya said to Fighthype. 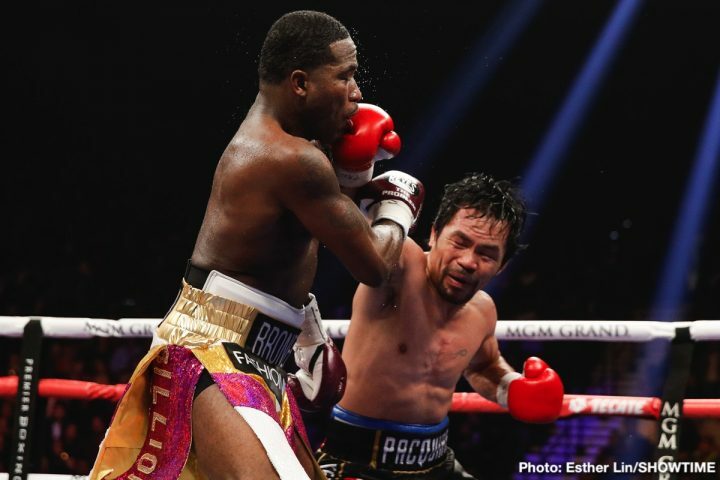 “I’ve always thought Broner can do a lot more, but it just shows you Pacquiao is Pacquiao. He’s hard working. He’s a fighter that throws you off. He throws a lot of combinations. He still has it, which isn’t surprising because Pacquiao is a hard worker,” De La Hoya said. Broner did look better against Pacquiao than he did in his fights against Adrian Granados, Mikey Garcia and Jessie Vargas. Broner arguably should have lost all three of those fights. He looked shot in those fights. Against Pacquiao, Broner was in good shape, but he failed to come forward and throw punches the way he needed to for him to have a chance to win. It looked like Broner was looking for a knockout on a counter shot, and that was not going to work for him against Pacquiao. Broner isn’t a big enough puncher to get away with fighting with that kind of style against Manny. De La Hoya isn’t giving Pacquiao, 40, a whole lot of credit for his win. This was a fight that Broner was always going to have problems the moment that it was signed. Pacquiao is an eight division world champion, who has been an elite fighter for most of his career. Broner hasn’t shown that kind of ability despite having captured four division world titles. For De La Hoya not to realize the huge problems that Broner was going to have with Pacquiao’s speed, power, work rate, movement and experience, it shows a certain amount of naivety on his part. Broner’s career has been on the decline since his loss to Marcos Maidana in 2013, and it was expected that he would come undone against Pacquiao. Broner was dominated by Mikey Garcia two years ago in July 2017, and that’s a fighter that Pacquiao would likely beat soundly if the two of them were to meet each other inside the ring. Oscar isn’t impressed with the pay-per-view numbers the Pacquiao vs. Broner fight pulled in. De La Hoya says he heard that the fight drew around 350,000 buys on SHOWTIME PPV, which he feels is an indication that pay-per-view is dying. The unofficial PPV numbers being mentioned for the Pacquiao-Broner fight is 400,000 buys. De La Hoya thinks that DAZN and ESPN+, which subscription based services for boxing fans to watch boxing, are changing the way fans watch the sport. Instead of the fan having to pay $60 to $80 to see PPV fights, they’re able to see interesting matches for the cost of their monthly subscription price. ESPN still has PPV, however. WBO welterweight champion Terence Crawford’s fight against Amir Khan on April 20 will be on ESPN pay-per-view. “The rumblings are that that this fight [Pacquiao vs. Broner] dd a little over 350,000 buys,” De La Hoya said to Fighthype. “I don’t know if there’s any truth to that, but when there’s smoke there’s fire. It goes to show you that a fighter like Manny Pacquiao, who is accustomed to generating bigger numbers than that, you have to question whether pay-per-view is dead or not,” De La Hoya said. What De La Hoya isn’t mentioning is that Pacquiao vs. Broner wouldn’t have done huge PPV numbers even during Manny’s best years. Broner’s career has imploded in the last three years, and he’s not the same fighter he was when he was fighting at super featherweight and lightweight. Broner’s losses to Maidana, Shawn Porter, Mikey Garcia, as well as his draw against Jessie Vargas and his controversial win over Adrian Granados, they’ve all hurt his popularity to the point where he’s arguably not as popular as he once was. “I strongly feel that DAZN has made such an impact on the sport in a positive way,” De La Hoya said. “I think ESPN+ has been doing a tremendous job, so maybe the pay-per-view model is dying. I’ve always been a big advocate of pay-per-viw, because my whole career was on pay-per-view, but we didn’t have the DAZN’s of the world or the ESPN+’s of the world [back then]. So, I strongly feel we’re in a new age, a new time. People don’t want to be told what to watch, when to watch, and where to watch it. They don’t want to pay $60 to $80 per fight. You can now pay $5.95 for ESPN+ or pay $9.99 for DAZN and watch Canelo-Jacobs, watch Anthony Joshua and Jaime Munguia. So it’s going to be interesting to see what happens in the near future,” De La Hoya said. Pay-per-view is likely going to be still be around for a long time to come, but it’s going to require that better matches are made for the fights to make good money. Pacquiao vs. Broner was not a great match-up for PPV and neither is Crawford vs. Khan. PPV fights should involve in the best fighting the best. Broner and Khan are both guys that are no longer relevant fighters. Khan hasn’t held a world title since 2011, and Broner last held a belt in 2016. Neither of them look capable of holding titles at this point in their careers. What will be interesting to see is whether ESPN+ and DAZN will have staying power far into the future or if those platforms choose to use the pay-per-view model that networks like HBO and SHOWTIME have used in the past. If boxing fans are paying monthly subscription rates and still needing to purchase fights on PPV, it’s going to be expensive.